We are pleased to welcome Jihoon Cho, assistant professor, to the Marketing Department. Cho received his PhD in marketing from the University of Michigan, MPS from Cornell University, and MS and BA from Korea University. His professional experience is in market research and media planning. Cho previously taught marketing management at the University of Michigan. At Michigan, he was awarded the Kendrick Marketing Award for Academic Achievement in 2016. 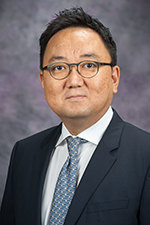 Jihoon Cho’s main research interest is building empirical models to examine strategic marketing problems such as customer learning, retention, and satisfaction. His most recent work has focused on investigating how customers develop expectations of and respond to firms’ product/service performance in quick-service restaurant, car rental, and pharmaceutical industries. Methodologically, his work applies statistical, especially Hierarchical Bayesian, methods and econometric techniques to current marketing problems.